Yay, I love the 9/80 schedule. Today is the last work day this week and I get tomorrow off. Woo-hoo!!! I had a repeat of yesterday's breakfast, which was great. 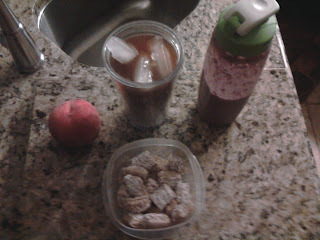 The pre-made smoothie held up to my taste test another day and really fueled me through my morning swim. I was so tired this morning, though, I just took it easy at the pool but still managed to get my laps in. Albeit, a little slower. When I got to work I got to enjoy some cereal, Frosted mini-wheats rule! I use regular 1% milk, that's my favorite but apparently, we are in the middle of a Milk War! Soy milk - I actually really like the 8th Continent light plain variety. It has a really light texture that actually works with some cereals. Rice milk - I love the taste! For me, it's almost like a special treat that reminds me of a healthy Horchata water. However, it's never really passed the cereal test for me because it's too sweet. I would only be able to enjoy it with a bowl of bran flakes or cereal with no sugar added. It definitely wouldn't go well my Reece's PB cereal! Almond milk - I can't remember the brand I tried, but it was really thick. I could not finish the glass I had. It just wasn't very appetizing and I shutter to think of what it would taste like in my cereal. Hemp milk - I recently tried this one, and it was NOT GOOD. I think I tried two sips and regretted the second one. Oat milk - I think I tried this one, but now I can't remember. I'll have to give it another shot though. In the end, I stick with skim or 1% and have some rice milk from time-to-time. Has anyone found a good substitute that passes the cereal test?